Usually people take this so-called Labor Day holiday off for BBQ cookouts, spades and dominoes. However, the movement and struggle for justice has no days off. Why? Because the opposition is not taking any days off in robbing the people of their rights. Thus it was no surprise to me today when I received this latest installment from the People's MC Jasiri X titled "We Coming"
He says it was "inspired by the Dream Defenders, BYP100, and the movement of fast food and low wage workers to get $15 an hour and the right to form a union. Young people are rising up all over the country and the world, believe me when I say, "WE COMING"! This brother never fails to deliver the bars necessary to awaken the people to what's important. One thing I admire most about him is he's not just sitting in the booth, dropping raps and releasing YouTube clips hoping to get his views up. He's an ACTIVE participant in the struggles he's rhyming about. Thus, the congruence of his words with his actions makes his songs even more effective in penetrating the souls of the people across all races. "We Coming" was filmed in Milwaukee, WI during the August 29th strike that took place in over 50 cities around the country. 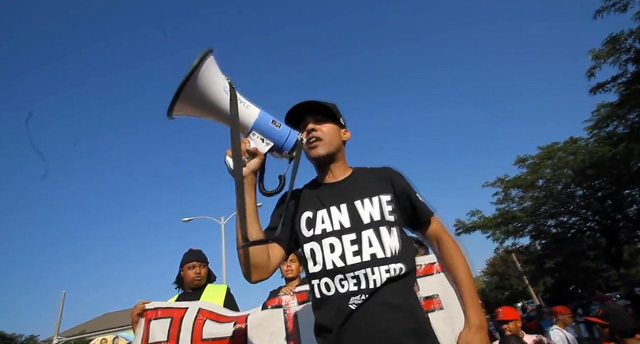 "We Coming" was produced by GM3, shot by Paradise Gray, and based off a chant by Artist and Activist Jazz Hudson.